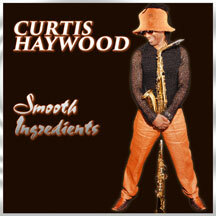 Smooth Ingredients is the long-awaited follow-up to Curtis Haywood's critically-acclaimed, self-titled debut. Smooth Ingredients is the long-awaited follow-up to Curtis Haywood's self-titled debut. The new album was produced with Grammy-AwardÂ® winning saxophonist Mel Holder, and it features JJ Sansaverino on guitar. The voice and passion of Curtis Haywood are clearly heard throughout each track and brings new life to the soulful interpretations of R&B favorites and contemporary jazz originals. Curtis continues to build a career of International jazz festivals, sharing the stage with such artists as Pieces of a Dream and Smooth jazz Pioneer Chieli Minucci of Special-FX. A child prodigy, Curtis Haywood moved from trumpet to saxophone at an early age. He studied at New York's High School for the Performing Arts and Boston's Berklee College. He went on to perform with New York jazz fusion group Joshua for several years before completing his self-titled debut solo in 2007, which went on to receive critical acclaim and steady airplay. His latest release has all of the Smooth Ingredients to keep contemporary jazz fans smiling.